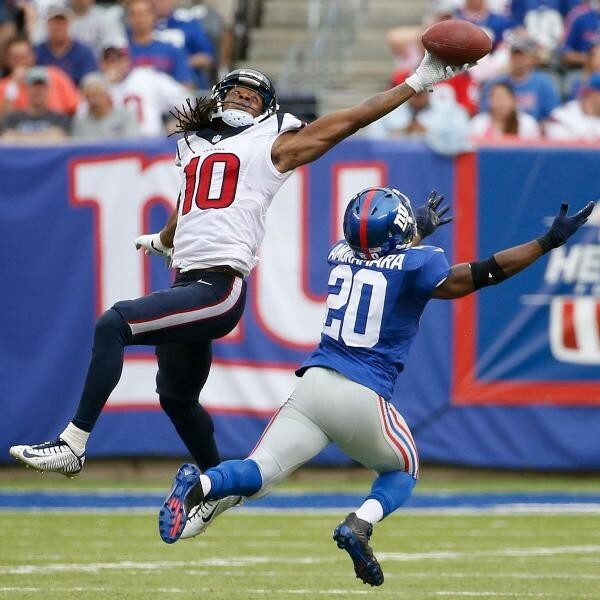 DeAndre Hopkins finished with eight catches for 94 yards and a touchdown for the Houston Texans. Hopkins led all Texans receivers in receptions yards. Through Week 8, Hopkins is second in the NFL in receiving yards (870), third in receptions (66), third in reception yards per game (108.8) and fourth in touchdowns (6). Arizona Cardinals receiver Jaron Brown made a leaping 39-yard grab in a 34-20 win against the Cleveland Browns that help set up a touchdown pass to tight end Troy Niklas. New Orleans Saints linebacker Stephone Anthony was credited with 11 tackles in the team’s 52-49 victory over the New York Giants. In his rookie year, Anthony is ninth in the NFC in combined tackles (56) and is leading the team in first hits (38).